Series of aerial hanging display cases with lock, in transparent extralight mm. 6 thick tempered and glued at 45°, available in straight (parallelepiped shape) and oblique (irregular prism shape) versions and with a mirrored back or with illuminated dimmer Led system. 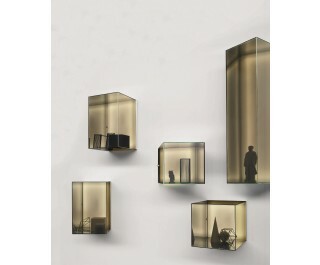 Objects within give the illusion of being magically suspended midair Special hinges fixed to the wall by means of a frame allow the glass cases to revolve enabling access to the inside. The display cases support a maximum weight of 15kg.